The power strip can handle up to 1700W (Works with hair dryer, hair straighter or curling iron) and features UL, Rohs and FCC certifications. The intelligent mSmart USB ports provide up 2.4A, which can charge almost any portable device at full-speed quickly and easily. The protector also comes with TYPE "C","G"," I" travel adapters that work in over 150 countries around the world. 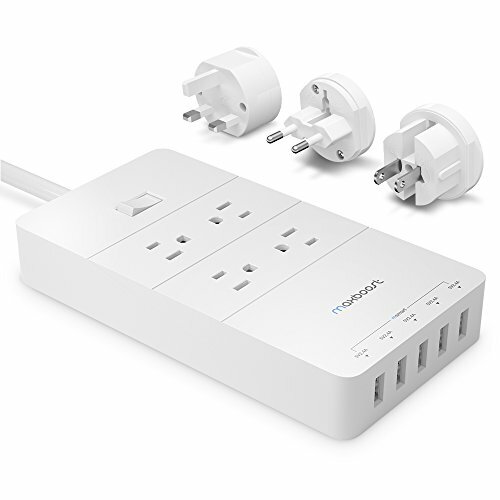 Smart Power StripFeaturing 4 AC outlets with a total power of 1700W, the power strip can easily power appliances such as blow-dryers, irons, and heaters. Equipped with 5 smart USB ports (2.4A max) the Maxboost Power Strip automatically identifies and adjusts to the optimal charging speed of your device for a high-speed charging experience.